Parts Donald Barthelme, Richard Powers, and George Saunders, Brock Clarke has distinguished himself as a writer fully in control of his ideas. One of the key signs of a solid and sometimes overwhelmingly good short story collection is that sense of fear and desire that happens when encountering and experiencing each selection. Too often, a poorly assembled collection will make its reader wallow through a sea of self-indulgence or a bright and shiny forum from which all sorts of literary tricks are displayed but nothing is achieved. Writer Brock Clarke -- whose peculiar 2008 novel An Arsonist's Guide to Writer's Homes in New England introduced us to the redemption-seeking post-prison tour of an accidental criminal named Sam Pulsifer -- knows how to build a perfect mixture of dark desperation and humor. His 2011 novel Exley continued in that vein, where a lonely man went in search of his father, finding connections in Frederick Exley's A Fan's Notes. Clarke's 2002 novel The Ordinary White Boy and 2014's The Happiest People in the World have continued in the mix of humor, pathos, and strange shifts in reality so common with writers of his stature. Parts Donald Barthelme, Richard Powers, and George Saunders, Brock Clarke has distinguished himself as a writer fully in control of his ideas. The best way to enter the world of strange reality and dark humor Clarke has created in The Price of the Haircut is to acknowledge his control and precision. Everything is in and about the strength of the scene. "Good Night" is a one paragraph, two-paged scene of a captured moment between a father and son (in the former's voice) as they were going to bed for the evening. They'd fought, and now the father was reflecting on the presence of his 14-year-old, how they "…might have argued about the way his armpits or breath stunk…" In an italicized line that will resonate with anybody who has been a parent of a child, the father reflects: "Oh God, what is wrong with me? You're such a sweet kid. I love you so much…"
"The Grand Canyon", another story that seems more experiment in stylistic structure than substantial and solid, still manages to work some magic. It's approximately four pages. A woman speaks in first person about the title location, her strained relationship with her husband, and the reader senses this is more exercise in extended metaphor than anything else. That said, a minor selection in this volume would prove a highlight in most anybody else's canon. In "What Is the Cure for Meanness?" we get a mother and son story that takes a twisted, pathetic, ultimately hilarious dark turn. A boy sides with his mother as he witnesses the sudden and acrimonious dinner table departure of his father. The son speaks: "Neither of us said a word, but I was thinking two things -- My poor Mom, and Will he take me with him?" Everything the son gives his mother as solace for the absent father dies. If there's a "happy" ending, it seems that sense of security will only be a book mark until the next shoe drops. "…Lizzie at her trial—grim-faced, defiant, strong… that's the thing I really notice, and maybe this is why we're here: because Catrine wants to be inspired by the example of a strong woman who faced adversity and survived, even if the woman is an axe murderer and the adversity is her axe-murdering." "…we still think about the jaunty angle of Mr. Wilder's top hat; his unruly, matted side-parted hair; his dashing cane; the cut of his tapered pants; his gentle way with the Ooompa Loompas… we sometimes wish we'd never met Mr. Wilder…"
Legendary author Mario Puzo plays a role in "The Pity Palace", where our hero claims that his wife got so obsessed with Puzo's Godfather novels that the author stole his wife. It's a sweet, funny, heartfelt look at this man as his Florence, Italy home becomes a Pity Palace. There's money to be made from anything, and Clarke nicely plays through the scenes without wearing out his welcome. The strengths of "Our Pointy Boots" are many. It's another "we" story, where Iraq War veterans plan for a tribute to their fallen comrade, a tribute that doesn't come to full fruition. It's a brutal meditation on the effects of combat, especially immediately after coming home. They talk of "our sweet babies" and they aspire only to wear their shiny pointy boots and move on. "'I mean, it's easy to forget how racist we all are," Aaron said. And then he turned to face his customers and said, 'All of us. You are all racist. Don't think you're not.' The customers put their heads down when he said this, but they kept clapping…applauding their own racism." In "That Which We Will Not Give", we follow a family as they work through the effects and consequences of an extended Thanksgiving joke. The matriarch had asked for a divorce, and the patriarch declares it was something which he will not give. It's a perfect blend of humor, careful details, and full circle drama. It's about holiday stories and anecdotes repeated ad infinitum: "Because the more often the stories were told, the less often the children remembered that there might be anything behind the stories." It's the title story, another "we" narrative, that stays longest with the reader. 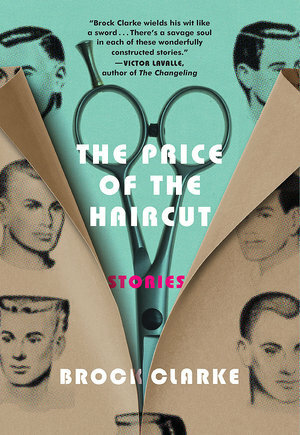 In "The Price of the Haircut", a collection of emotionally insecure middle-aged white men question whether or not they should find the cure to their bad haircuts by patronizing their local racist barber. It opens with a very concrete tone. These are the facts -- or are they? "On Monday, an unarmed black teenage boy was shot in the back and killed by a white policeman." The mayor's commission determined the cause of the subsequent racial unrest/riot was "…a barber named Gene who charged eight dollars for a haircut and who had said something racist while giving one of those eight dollar haircuts." What follows might seem mundane, and on its surface it is. The men don't question the presence of the racism. They don't wonder how they might be able to be the change things. The only question is whether or not they should get the haircuts. "We needed to assure people -- ourselves too -- that we were against what we were doing even as we were doing it." There were no black protesters outside the barbershop, only white men waiting to get in. Our heroes (always speaking in a royal "we") understand that "We were where we needed to be." They were nothing more, nothing less, and they were trying to find their places in a world that was passing them by. It's a beautifully controlled balance of reflection and eventual enlightenment that may never come to life, but these men cannot be blamed for their attempts. Clarke's The Price of the Haircut is an impressive collection of stories, some more stylistic than substantial, but they should all entertain and challenge and linger. Clarke has created an impressive world here that's well worth visiting.